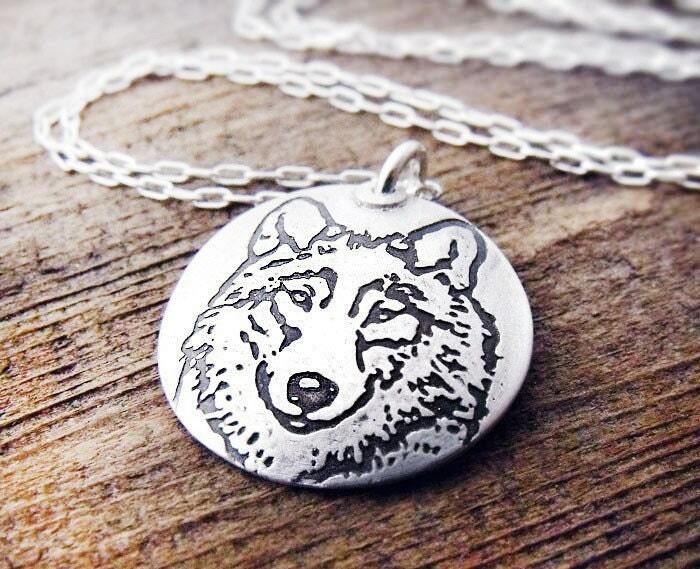 The pendant is made of fine silver and is about 3/4" (19mm) in diameter (or around the size of a US dime) and is embossed with original artwork of a wolf. The finish is matte and you have a choice of a 16", 18" or 20" .925 sterling silver chain. It's shown on 16"
Each piece is made by hand and may vary slightly from the photo. The piece shown being worn in the 3rd photo is for size purposes only, it's a different design.This comes in a recycled gift box tied with a raffia ribbon, ready for giving. Beautiful in every way. The workmanship and clarity of the wolf image are exquisitely done. More than happy with this purchase. Got this for my niece for her birthday, and she loved it! These delicate animal pendants are perfect. Small but detailed, well done. I purchased the bear as a gift for a friend and decided I had to have one for myself!